A Portglenone heroin addict who stabbed his partner to death in front of their seven-year old daughter was handed a minimum 12-year sentence for the “senseless” murder. As friends and relatives of Ms Dunlop said in the public gallery at Antrim Crown Court, sitting in Belfast, 43-year old McAuley, from Townhill Road in Portglenone, was told he will serve a minimum sentence of 12 years in prison, without remission, before he can begin to be considered for release by the Paroles Commission. On Friday, the court heard that as a result of seeing her father stabbing her mother to death, the couple’s daughter suffered a “complex and traumatic experience” which will require “long term and on-going” therapeutic work. McAuley was told by Mr Justice Weir that he had caused “enormous and permanent harm” to his daughter. The fatal stabbing occurred in the living room of Ms Dunlop’s Centuripe Avenue home in Ballymena in the early hours of June 15 last year. The court heard that prior to the knife attack, on the evening of Saturday June 14, Ms Dunlop (32) and McAuley had gone to her father’s house. As they made their way back home in a taxi, accompanied by Ms Dunlop’s step-mother, the taxi stopped at an off licence where alcohol was bought. When the taxi arrived back at Centuripe Avenue, Ms Dunlop’s seven-year old daughter returned home from the babysitter’s and a decision was made to watch football on the TV. As Ms Dunlop - who at the time was drunk and had taken prescription drugs - sat on the sofa, McAuley went to the kitchen where he armed himself with a knife. He returned to the living room, where he stabbed his partner three times in the upper body in front of their daughter and Ms Dunlop’s step-mother. A wound to her chest, which passed through her left lung and heart, proved to be the fatal injury, while she also sustained stab wounds to her right shoulder and her upper right arm. Since murdering Ms Dunlop, the court heard McAuley has made the case that he acted as he did due to provocation. However, the Judge said that while he accepted the couple’s 13-year relationship was on and off - largely due to McAuley’s suubstance abuse - there was no history of violence between the couple, and there was “no justification” for McAuley’s actions. 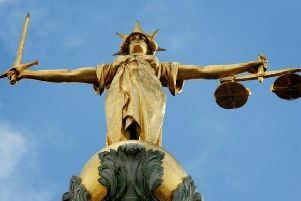 Mr Justice Weir told McAuley: “You are a powerfully built man of six feet one, while the deceased was a foot shorter. There was no excuse for bringing a knife in to this silly domestic dispute. Telling McAuley that he carried out a “determined” knife attack, Mr Justice Weir said it was “entirely disproportionate” to any insult or minor injury he sustained. Regarding McAuley himself, the court heard he has 44 previous convictions. He also murdered his partner whilst under a suspended sentence for an previous incident during which he shouted “Seig Heil” and carved satanic symbols with a knife on the front door of a property housing foreign nationals.